The weather could not have been better for this weekends 28th annual Mushroom Festival held in the Mushroom Capital of the World - Kennett Square, PA. The festival is always the weekend after Labor Day. This year it was September 7th and 8th, 2013. All the years living in South Jersey (which is somewhat nearby), we have never gone to this festival. This was the year we finally made it. The gorgeous weather beaconed quite a crowd. We parked in a nearby lot and took a shuttle bus to and from the festival. The mushroom fest had something for all ages, making it a fun way to learn more about mushrooms. 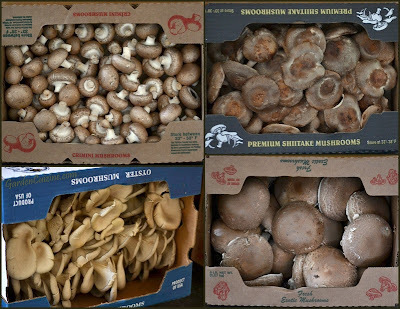 My only wish was that there were more mushroom focused foods in the sea of "junk" food vendors that lined the main street. It would also be nice if there were more rules prohibiting vendors such as bathtub sales, which seemed out of place and was annoying to see at a public fair promoting food and agriculture. Antique and classic cars lined a neighboring street, attracting visitors near the culinary event tent. 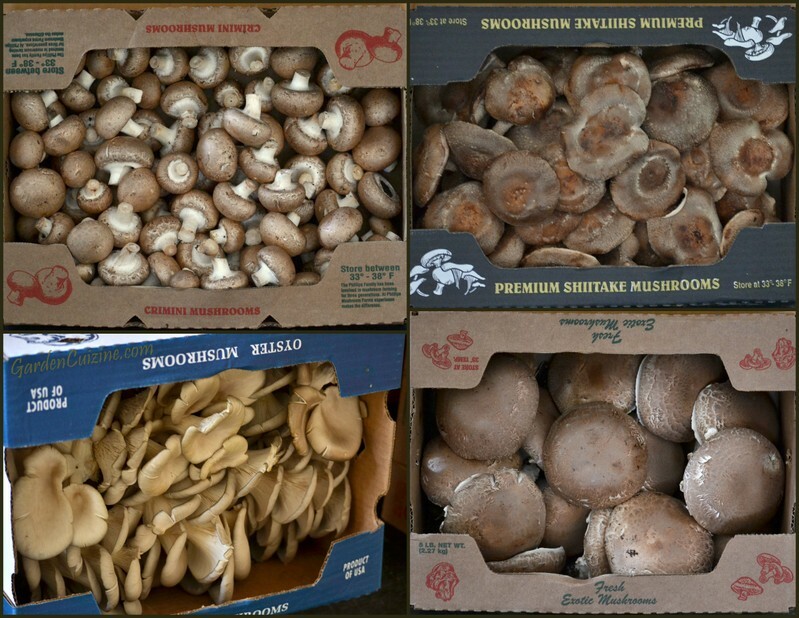 The shiitake mushroom farm tour we planned to go on was sold out by the time we got there to get our tickets. 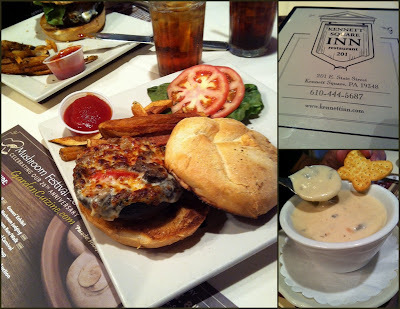 We regretted not purchasing our tickets before eating lunch; however, we didn't regret ordering portobello burgers and mushroom soup at the Kennett Square Inn. Harry was amazed at how meaty a vegetarian portobello mushroom burger tastes. I'm sure another sell out was on Sunday to see Carla Hall, co-host of The Chew and former Top Chef contestant. Missing the farm tour allowed us time to stroll through the culinary event tent just in time to see Chef Jack Mavraj, owner/chef of La Verona Italian Cuisine and Bar, who cooked one of his menu items - braised beef short ribs and mushroom hand made agnolotti (stuffed pasta similar to ravioli) with an exotic mushroom beef broth using a demi-glace reduction and truffle butter imported from Italy. 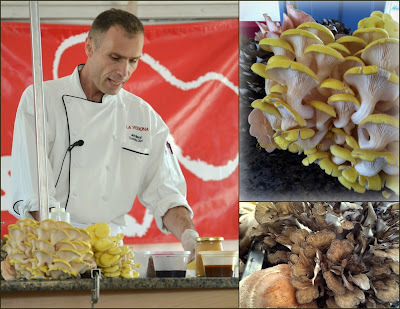 Chef Mavraj was surrounded by a display of gourmet mushrooms that included Maitake (Grifola frondosa), Shiitake (Lentinula edodes), Portobello and Golden Oyster (Pleurotus citrinopileatus). We made note of his Kennett Square restaurant, LaVerona, located at 114 East State Street and look forward to dining there next time in Kennett Square. Blog post and photos Copyright (C)2013 Wind. All rights reserved. This shot was taken bright and early in the Adirondacks with Adirondack Life Magazine photographers! The Dietary Guidelines for Americans (click image) is published every 5 years since 1980 by the US Department of Health and Human Services (HHS) and the Department of Agriculture (USDA). Dietary Guidelines 2015 provides authoritative advice for people (age 2 and older) about how good dietary habits promote health and reduce the risk for major chronic diseases. The guidelines serve as the basis for Federal food and nutrition education programs. turns out this once terrified wall climber wasn't feral at all. He just ended up living outside for years patiently waiting to be rescued. He now lives happily indoors! As of January 2012, The American Dietetic Association (ADA), the world's largest organization of food and nutrition professionals was officially renamed the Academy of Nutrition and Dietetics (A.N.D.). A.N.D. is committed to improving the nation’s health and advancing the profession of dietetics through research, education and advocacy. In the past 20 years, there has been a dramatic increase in obesity throughout the United States. These slides were part of a power point presentation* illustrating the speed of Obesity rising across the U.S. Break away from these trending Obesity statistics, which can lead to premature mortality and complications from coronary heart disease, hypertension, colon cancer and diabetes. Consult with your Doctor and a Registered Dietitian! Make a Hot Pepper Ristra for Good Luck! Fresh Pumpkin, Perfect for Pie! Have You Tasted A Persimmon? Outdoor Yards and Gardens are home to thousands of ferals, special cats, that need your help. Contact The Humane Society, Alley Cat Allies or a shelter near you. YOU can make a difference! My Tango the Garden Cat story was published on Dave's Garden's online international website and was available for many years. It sadly has been removed and is no longer available. Maybe someday I will rewrite the Tango story for a children's book. Gifts for Garden Cat Lovers!